Lining up the dead in the wake of Typhoon Haiyan. Typhoon Haiyan slammed into the Philippines a week ago destroying entire cities and towns in several provinces across the country. After 5 days, people have started complaining about the slow response from the national government. Others were more apologetic, saying organizing relief operations for a catastrophic calamity, the likes of which were unprecedented, takes time. One such major contributor to the slow government response was the lack of communication. To be fair, I personally remember November 8 (Day 1) - when only 3 people were declared dead. All local news agencies that remained in Tacloban through the typhoon were not able to broadcast their reports because it was simply impossible - not until Day 2. One would assume the gov't only started mobilizing relief operations then. 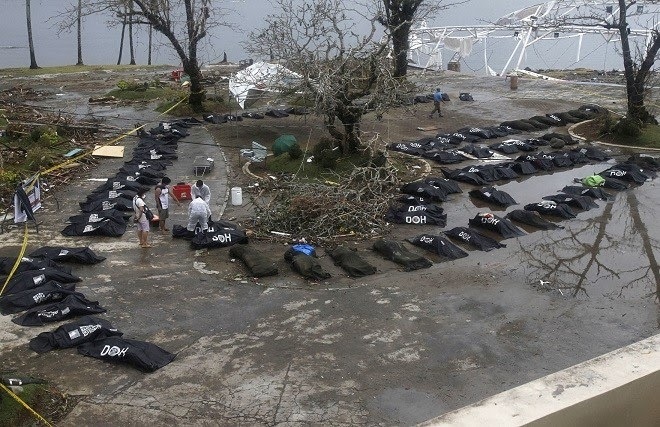 And only then will the world know of the tremendous death and destruction left in the wake of Haiyan. Tacloban airport re-opened on Day 3. It's possible help only came trickling in between days 3 and 4 before any meaningful large-scale relief could be properly set up. Any criticism on the slow relief operations would seem natural then. Who wouldn't? It's been 5 days (4 days after communications were restored - for the news networks at least). But here is where President Noynoy Aquino magnanimously came into the picture - with his bombshell of an interview on CNN, refusing to take any responsibility for the slow response and blaming everything on the 'unpreparedness' on the part of the LGUs (Local Government Units). Right off the bat, he declares: "The government's immediate response has been reassuring to the vast majority of our people". I don't know if he's talking about the victims in Tacloban or those comfortably watching TV Patrol's coverage in their living rooms (albeit filtered of anything that remotely resembled bad press for the national government, thanks to Korina's influence in the news program itself). 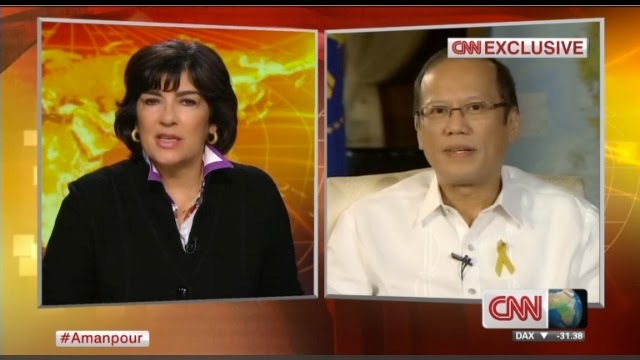 Amanpour: Some say your presidency will be defined by how you handle this crisis. He continues: "...(we have) the ability to take care of our problems rather quickly". This interview was happening almost simultaneously as Anderson Cooper was reporting live from Tacloban, as he ironically highlighted the disorganized and minimal relief efforts from the Philippine government considering 5 days have already passed while the dead still littered the landscape just a few kilometers from the airport. When asked about the possibility that his presidency will be defined by how well he responds to the crisis, he wiggles out of the question and instead lambasts the LGUs in Tacloban as well as other towns/cities which were heavily hit with a big "I told you so" for not heeding his warning for proper evacuation. He is thoroughly convinced he has done nothing wrong and will not take any responsibility for the slow response by the national government. There may be rational reasons for the slow government response, but there is no excuse for a leader to blame his crippled constituents, specifically the LGUs who have suffered huge losses or are victims themselves, for not doing their jobs. Neither is there a need for useless partisan politics at such a time like this.